Initially Quality Smith relied on a Barracuda appliance (Spam Firewall 200) to protect its email. Quality Smith found this solution did not provide them with the low maintenance overhead and high levels of functionality that was required. Since installing SpamTitan, I no longer worry about whether my spam solution is working or not, it just does! Initially Quality Smith relied on a Barracuda hardware appliance (Spam Firewall 200) to protect its email. Quality Smith found this solution did not provide it with the low maintenance overhead and high levels of functionality that was required. Before trialling SpamTitan, Quality Smith was getting about 300,000 spam messages per day. The average end-user was receiving about 10 pieces of spam per day. Following the installation of SpamTitan, the daily spam levels dropped to less than 20,000 representing a decrease of over 93%. 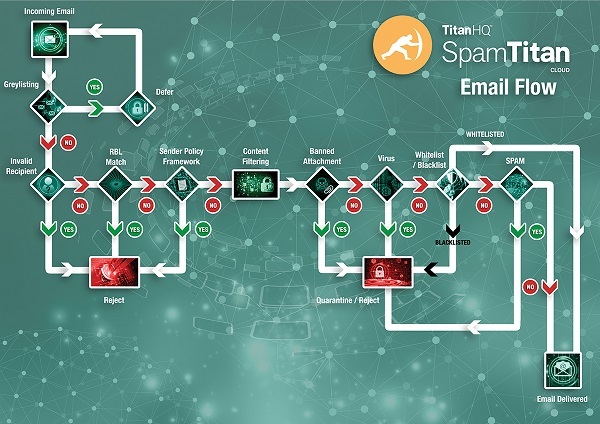 Due to the many frontline features incorporated in SpamTitan, 90% of the spam emails was blocked before even getting to the SpamTitan appliance. At this point they began to evaluate other solutions. We downloaded a free 30 day SpamTitan trial and were very pleased that it was so easy to use and effective. “I liked very much the idea of being able to ‘trial before you buy’. said Kevin Bidwell, Information Systems Manager. Enterprise-class security. SpamTitan uses a range of technologies, including OCR, to ensure that 99% of spam is canned before it reaches the mail server. Industry-leading anti-virus engines from ClamAV and Bitdefender ensure complete protection from viruses and other email-borne threats. Rapid installation and easy management. SpamTitan can be installed and configured in under 30 minutes. End-users have control over their spam, reducing the workload on IT and reducing the chance of misidentification. Spam rules are automatically updated to ensure that new and emerging threats are rapidly blocked. Low cost. SpamTitan is significantly less expensive than competing solutions, bringing enterprise-class security within easy reach of the smaller business. Rapid installation and easy management. SpamTitan can be installed and configured in under 30 minutes. 99% of spam is canned before it reaches the mail server. Following the installation of SpamTitan the daily spam levels dropped by over 93%. SpamTitan uses advanced predictive techniques to detect ransomware and malware, spear phishing attempts, and zero-day attacks. These enhanced controls ensure more malicious messages are blocked and end users’ security awareness is not put to the test. Many organizations use Office 365 for email. 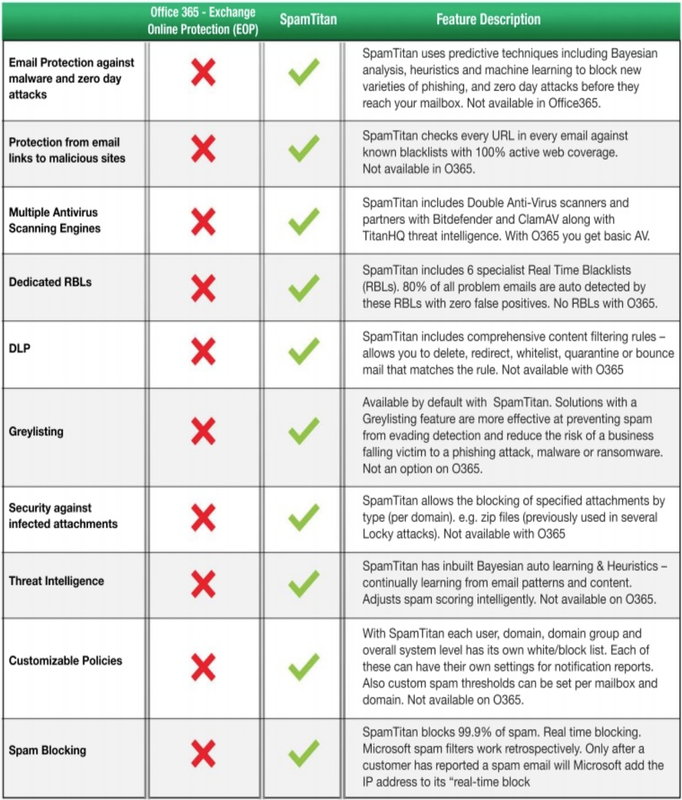 Microsoft has incorporated security features into Office 365 to detect and block spam and malware; however, organizations that have grown accustomed to dedicated security solutions with advanced filtering and advanced reporting capabilities are likely to find that the default security offering on Office 365 falls short of requirements. SpamTitan uses many different mechanisms to detect spam and malicious emails, including SURBL filtering, Bayesian analysis, machine learning, greylisting, dual anti-virus software engines, and malicious URL detection mechanisms. The result is enhanced spam detection and more reliable blocking of new malware and ransomware threats.